recently I've had the boss health frames on top of my toon, I can't seem to move them, or disable them. its a good feature but on DBM I can't find where I can force some of the abilities that I think personally are important to me, so then I can emphasize that (5 countdown) to make me more aware of it. 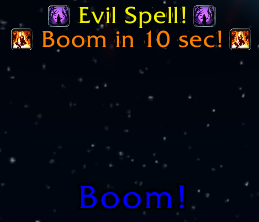 for example in dungeon heroic slags, and on gug'rokks unstable summon add, I always hear the 5 second countdown so then I switch on add. but then on mythic twins there is an ability that i really need to have that 5 second countdown (Death charge) i need to move out of it , and sometimes I miss it, so i wanted to focus this and have countdown for it, how to do it? 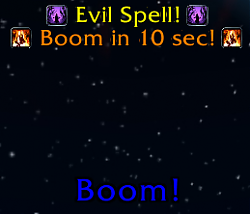 i try to avoid adding countdowns to abilities that are a bit variable. people sort of expect an ability to happen at 0 on countdown, if it doesn't, they wonder why the countdown is there. Since berserker rush can have delays and variations is why I didn't give it a countdown option. Last edited by jessica : 12-17-14 at 02:41 AM. Can you add a voice module to this addon? I wouldn't mind voice modules to be honest, However, they are a lot of work and I'd need someone to do the voices for me. VEM did a great job with their voices, however what I didn't like was that they'd forked my work (legally so of course, under creative commons license 5.x mods had). It was just unfortunate to bust balls on beta/ptr 16 hours a day several days a week to make mods every patch, only to see someone else copy all that work as their foundation, then improve upon it with voices. Easy to make voices when you skip the hard work :\. it's actually why dbm 6.0 encounter mods no longer uses an open license, to protect my work. I'd be more interested in if something like VEM could become available as a DBM plugin that adds functionality to DBM though, vs a replacement to DBM that throws my hard work in my face. I'll happily make needed changes to core to support external voice modules to be able to hook back into my mods. Maybe add callbacks to all timers/alerts that a voice pack could simply listen for certain events and playsoundfile on eventID, things like that. That'd be sweet. Thats sweet news, then VEM author can easily create that plugin and I think he wants to do that from what I read in his github, but also can you add it so that he can also use the arrows/marks(on ground) - because on VEM not only he adds the voices, he also adds the arrows and marking in ground which is also nice. I have a question. I have googled this, looked through multiple comment boards about DBM. I just can't find an answer or any mention of this anywhere. Randomly throughout my daily playthrough of the game, I will get bars that show up pertaining to other people's abilities around me or sometimes about my own character. This also happens with people's abilities in raid. It's very spam-like and I only want DBM to show up during raids and only want them to pertain to the NPC's that I'm killing. What do I disable to stop these from coming up? Last edited by highhbrid : 08-28-14 at 08:48 PM. Hi can I ask something, any1 feel free to answer if you know. 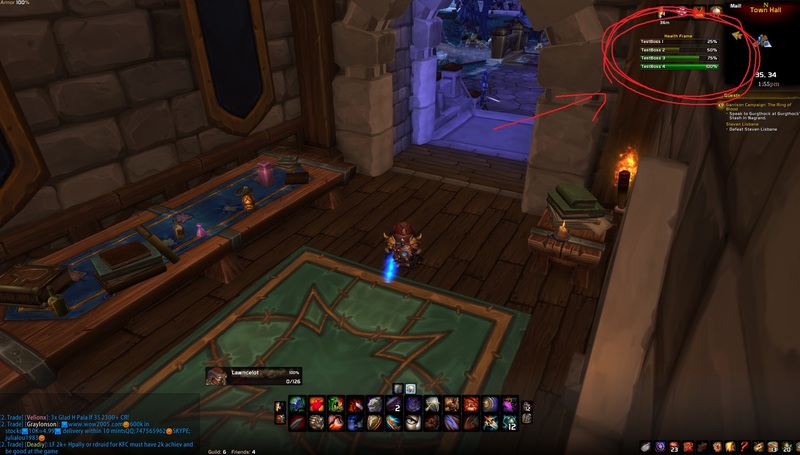 Ideally I want to hide the blizzard boss frames that show up to the right (Under minimap) and I want to use the DBM healthframes, so in the option of DBM I went to health frames and I checked where it says "Override.....etc" innetionally I thought this would hide blizz boss frame and show the dbm healthframe instead, but then I joined a flex and found out that both will be shown if i checked this. Re: Custom templates no longer working? I'm suddenly finding that custom templates (that replace the DBT-Template.xml in DBM-Core and use custom textures) are no longer working. I tried a couple, one from the old DamiaUI and Boda UI DBM skin (Link) and it's putting the type of green "texture not found" squares on the bar sparks and the icons are misaligned with the borders. These were working fine for the past couple of years til the updates to DBM this week. Is anyone else finding this? Having a similar problem and can't figure out what the issue is. What have changed? And why? Custom templates no longer working?